Protesters resisting eviction during the Wanstead seige. Road Protest site at George Green, Wanstead, London. The M11 link road protest was the start of a major anti-road protest in Wanstead and Leytonstone, in autumn 1993 opposing the construction of the M11 Link Road. It began with a protest to save the 250-year-old sweet chestnut tree that grew upon George Green. 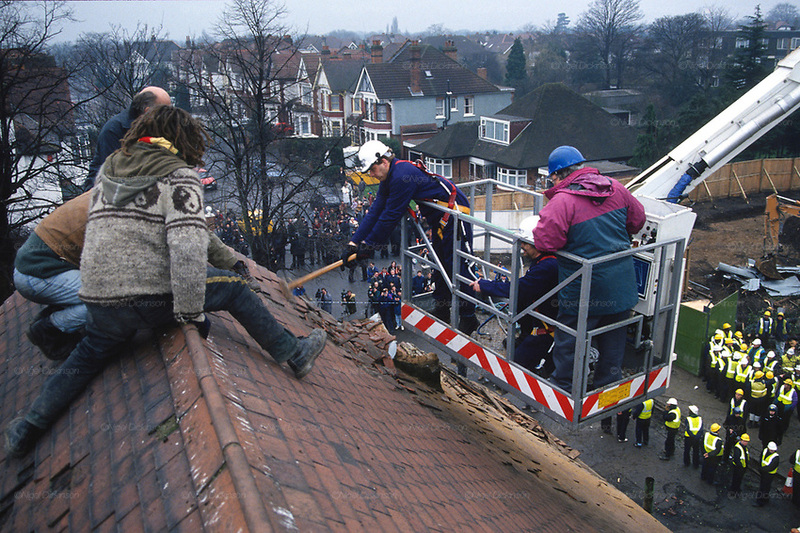 In winter of 1993 dozens of protesters occupied a house on George Green, Wanstead. In the early morning of 7 December 1993, several hundred police and bailiffs arrived to evict the protesters, which took a day hours to carry out.